Rahul Gandhi alleged both the BJP and BJD follow the "same Gujarat model" in which there is a "deal" between the Chief Ministerial candidate and industrialists. Rahul Gandhi alleged that governance under the "Gujarat model" is handed over to key bureaucrats. 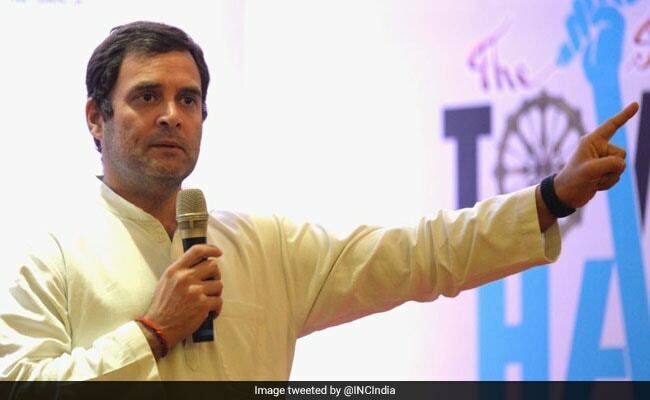 Congress President Rahul Gandhi on Friday slammed the BJP and the ruling Biju Janata Dal (BJD) in Odisha, saying both follow the "same Gujarat model" in which there is a "deal" between the Chief Ministerial candidate and industrialists. Mr Gandhi alleged that governance is later handed over to key bureaucrats. "The BJP model and the BJD model are the same as Gujarat model. It's a very simple deal between the Chief Ministerial candidate and industrialists who fund his campaign. The Chief Minister hands the state over to key bureaucrats who run it," Mr Gandhi told a town hall meeting in Bhubaneshwar titled 'The Odisha Dialogue'. He said "we allow our leaders to talk to each other" and added that the Congress was not "a bureaucratic dictatorship". "My model is that people know more about their state than I do and I intend to learn from them. When we run a state, we listen to the people. That's not how (Narendra) Modi or Naveen Patnaik think. Has Modi or Patnaik ever had such conversations with you?" Mr Gandhi asked. "Modi thinks he knows about everything. The BJP and BJD don't have a feedback loop and that's the big difference between them and the Congress," he added. Mr Gandhi said the key problems before the country were jobs, farm distress and credit to small businesses and there was a need to rethink the development paradigm. He said China far outpaces India in job creation and the PM Modi-led government had failed to deliver on its various promises including that on providing employment.